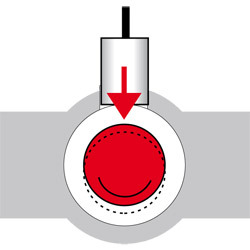 The lubricating gap of a plain bearing is influenced by several factors such as temperature, speed, angle, load etc. This influence can only be measured under operating conditions. Therefore, a measurement system which detects the gap size or the shaft displacement is subject to strict requirements: temperature stability, resistance to pressure, oil resistance, small size. ture sensors enables them to be inserted in even the smallest of bearings where they deliver reliable, accurate measuring results and high resolution of the values.